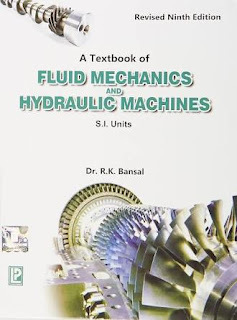 A Textbook of Fluid Mechanics and Hydraulic Machines is an ultimate book for students of mechanical engineering. Revised and updated, this book contains all the chapters and topics matching the latest syllabus of mechanical engineering. Popular nationwide, this book helps students to gain comprehensive knowledge about the subject. Clear and easy-to-understand the language of the book makes it ideal for all. A set of solved problems is given at the end of every topic. Chapters are divided into different topics and supported with detail explanation, examples and diagrams wherever required. At the end of every chapter, important highlights and exercise are provided, so that students can revise the entire chapter in a short time; while exercise allows them to check their grip on the subject. A Textbook of Fluid Mechanics and Hydraulic Machines (SI Units) Revised 9th Edition by R. K. Bansal is published by Laxmi Publications. Dr R. K. Bansal: He was graduated in 1966. He obtained his Master Degree in 1975 with HONOURS from I.I.T., Delhi and PhD in 1981 from University of Delhi. He joined Delhi College of Engineering as a Lecturer and became Assistant Professor in 1984. He was selected for the post of Professor in 1995. He also held the posts of Head of Mech. Engineering (Faculty of Technology, University of Delhi), Dean (P.G.) Studies and Dean (U.G.) Studies, Delhi College of Engineering, Delhi. During his teaching career of about thirty-five years, he guided a large number of research students and got published many papers. "Dr Bansal" is the author of many books, which are followed as textbooks.